QUALITY LINEN, TOWELS, ELECTRIC BLANKETS, BLANKETS & DOONAS ARE ALL INCLUDED. Accredited, regional tourism award winners in both "Self-contained" and "Budget Accommodation"
Escape to our lovely White Hut Chapel or one our 8 luxury 2 bedroom cabins in a bush setting surrounded by vineyards, for peace & relaxation in your home away from home. 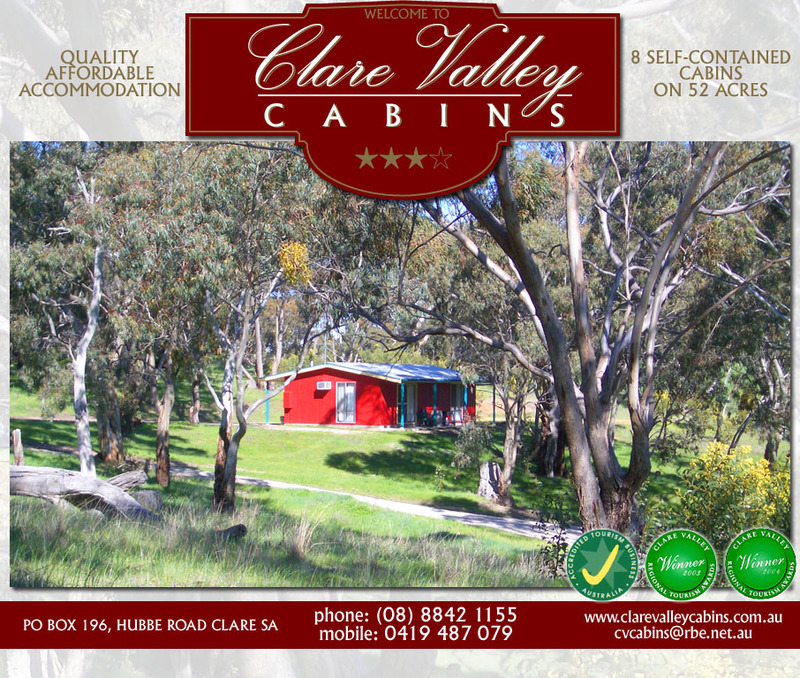 Only minutes away from Clare’s attractions, our cabins are cosy and private, comfortably accommodating four adults or a family of six (maximum 4 adults) with pampered pets welcomed. Our Chapel accommodates 2. Each cabin has its own family size Weber Q BBQ and inside is fully equipped with a microwave oven, oven with cooktop, full size refrigerator and freezer, wood heater, reverse-cycle air-conditioning, flat screen digital tv, dvd and CD. Our Chapel is also fully self-contained with reverse cycle airconditioning. An easy 2 hours from Adelaide we are situated five kilometres north east of Clare off White Hutt Road on Hubbe Road. The property is 52 acres in size with 10 hectares of natural bushland, providing, bushwalking, bike riding, and bird and animal watching. Our broad open skies offer the best opportunity to stargaze in peace and serenity. Erica is accredited in Relaxation Massage, Reiki and acupressure and can offer an in-cabin massage for the ultimate holiday indulgence. CALL ERICA ON 0419 487079 FOR A GREAT DEAL! 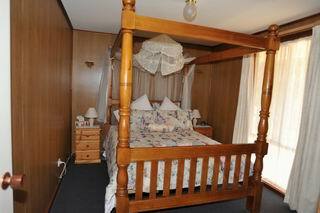 Cabernet Cottage is our most romantic and privately located cottage. There is a Four Poster Queen bed and two single beds in a separate bedroom. This with a recliner lounge suite provide for a cosy relaxing getaway. If you like local history a wander through our White Hut Cemetery will stir your imagination about our pioneering past. Cabernet Cottage is uniquely decorated and features a Four Poster Bed. A romantic wood fire will ensure you're cosy and warm and reverse cycle airconditioning for extra heating or cooling as required. Absolute peace and quiet at night means a you'll drift off to sleep in the comfortable queen size bed, complete with quality linens and an electric blanket and doona. Optional breakfast provisions await in a full kitchen with plenty of utensils to cook, including stove, microwave and electric frypan. A family size Weber Q barbecue is provided for each unit. Enjoy the beautiful sunsets and birdlife with a glass of wine from the many cellar doors of our region. Five minutes from Clare's restaurants, enjoy a value pub meal or a long lunch. Take time out to enjoy a bike ride on the Riesling Trail or a walk around our 52 acres. Your stay includes the use of our bikes. Marvel at the spectacle of the stars at night and the birdlife by day. Catch a glimpse of kangaroos at sunset. A stay in Cabernet Cottage will tempt you to return and recapture the experience, or try another of our cottages.